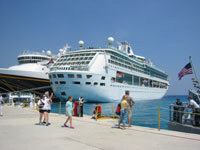 COZUMELINSIDER for almost twenty (20) years has been your online source for the weekly Cozumel cruise ship schedule! We were the original source for the cruise ship schedule as "back in the day" when we started Cozumelinsider, there were no cruise line schedules being published for the daily cruise ship arrivals online or for that matter, "anywhere". We have always featured the ship name, pier/dock name, arrival date and the arrival/departure times which makes our cruise ship schedule one (1) of the most complete of any schedules you will find available online today! So please pass along the word about our cruise ship page and we would be grateful if post our link on your favorite travel blog(s) and chat board(s)! Thank You!!! COZUMEL has grown over the years to be one (1) of the top and busiest cruise line port of call destinations here in the Caribbean. Annually over 3.3 millions cruise ship guests arrive in Cozumel and we have a total of five (5) piers; three (3) cruise ship piers; one (1) freight pier; and one (1) additional smaller pier which serves the people ferries from Playa del Carmen! Daily Cozumel hosts thousands of cruise ship tourists that arrive looking for a fun-filled day on our tropical island paradise. During the high season months that run from November to April, Cozumel often plays host to 20-30 cruise ships WEEKLY ~ this equates to between 70,000 - 80,000 weekly island guests. So you can see that with these numbers, coupled with the small window of time in which the passengers have to enjoy Cozumel their shore time, it is imperative that crusie ship passengers attempt to "PLAN AHEAD" and "MAP OUT" their day's excursions in advance. This planning will ensure they are able to see/do as many of our wonderful sights and activities possible during these precious hours they have while docked in Cozumel. THEREFORE, to ensure the most efficient use of your time and dollars in Cozumel we recommend you do everything you can to orient yourself to where you will be docking, learn about various transportation options available at your port of call location and pick out what activities or excursions you might be interested in experiencing! Please keep in mind, you again have very limited time so we highly recommend you do not pick 5-6 activities as it is just not reasonably possible to do all of those (and it will just stress you out running from location to location - not what we want for your island experience). We recommend you limit your activities to one (1) or two (2) selections and then plan your travel or activity route that will avoid "doubling back" when on your island journey. Many cruise ship passenger itinerary documents that are issued by the cruise lines will indicate which pier will be used in each port of call for disembarkation. With this information as a starting point, you may now begin mapping out your day in Cozumel, ensuring you get the most out of your vacation time (and dollars) while on the island! The BEST way to plan your day on the island is obviously with a map! COZUMELINSIDER has the BEST Cozumel map as WE helped design and create it (and maintain it to ensure it is updated appropriately)! YES ~ Order Me a Cozumel Island Map! Find out what's happening in the area! The Chart can be re-organized various ways by clicking on the underlined titles above in the columns. Times shown are "ISLAND TIME" - Eastern Standard Time ~ Daylight Savings Time is NOT OBSERVED. Note: The schedule is published as a courtesy from information provided by the Port Captain. Cozumelinsider.com IS NOT responsible for errors, last minute changes in port assignments or omissions. Cozumel's oldest pier and is now home to the people ferries that transport passengers back and forth between Playa del Carmen and the island. Often times, if cruise ships are tendering passengers due to lack of space at a cruise ship pier, the San Miguel Pier is the tender point. Passenger ferry transports to the mainland for those wanting to visit for shopping, etc. Our third cruise ship pier has berths to support a total of three (3) cruises ships (2 large or 3 medium sized ships) simultaneously as well as play host to visiting marine vessels such as US Coast Guard cutters and large private yachts. This was the first cruise ship pier constructed in Cozumel and was has recently been expanded to accommodate up to four (4) ships simultaneously. 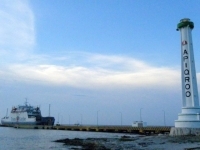 This second cruise ship pier that was constructed in Cozumel was completely destroyed by Hurricane Wilma in 2005. 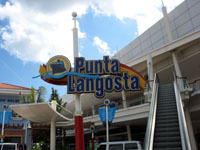 Following a $50 million reconstruction, the pier reopened in the fall of 2008 with capacity to support two (2) cruise ships and plans for future growth. The rebuilt pier was designed to withstand a Category 5 Hurricane. Just recently in October 2015, the pier opened a 3rd berth after an additional $20 million expansion. For decades this freight ferry pier was located between the TMM/SSA International Pier and Puerta Maya Pier although most people never noticed or mentioned it since its length and size didn't compare to the nearby cruise ship piers. But in 2012 a brand new freight ferry pier and staging area was completed next to the lighthouse that sits between downtown and the two (2) southern cruise ship piers. The relocation of this pier for freight and vehicle transport alleviated much of the traffic congestion at the southern cruise ship piers. Transports passenger vehicles for those wanting to visit the mainland via car for shopping, etc. 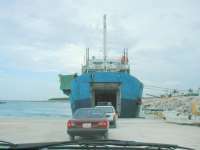 CLICK HERE for more details on the transport of vehicles between Cozumel and the mainland. Some Fun Things To Do! Support Our Website - Book Online! Visit Cozumel's only Butterfly Sanctuary! Merged in 2018 with the Cozumel Butterflies & Botanical Gardens, see multitudes of colors, learn about butterfly habits and the miracle of metamorphosis. 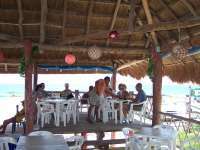 Take photos and then stay to enjoy snorkeling and the other ammenities of the PalMar Snorkel Beach Club. Great family fun & excellent value! If "Action" and "Speed" are what you seek in excursions then the Royal Swim is for you! Action and Speed pretty much describe this popular dolphin program! Get a handshake, a kiss and then you give them one. Feel the strength of your new friends as they push you across the water from the bottom of your feet in the thrilling foot-push. It is "the experience of a lifetime!" Cozumel's largest natural eco-park featuring a lighthouse to climb, Mayan ruins to see, coves to snorkel, a nautical museum, sea turtle nesting areas, a crocodile sanctuary, an enormous mangrove lagoon where spoonbill flamingos nest and white egrets go hunting daily along with a multitude of other animal species that call the park home. Experience Cozumel's wildlife up close and personal during this unique tour excursion activity! The Dolphin Scuba Program is every diver's chance to make their dream of diving and interacting with dolphins come true! An exciting program to meet the most incredible creatures of the planet! Live an hour diving with dolphins in the turquoise shallow waters surrounded by their natural environment. 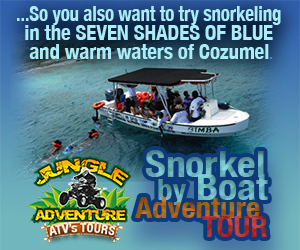 Snorkeling from the shore is great but for something different, take a relaxing cruise aboard our Charters across the crystal clear waters of Cozumel to beautiful snorkel areas and the shallow beach area called El Cielo. Experience the thrill of scuba diving in one of the top dive destinations in the world with Cozumel's leading dive shop ~ Dive Paradise! 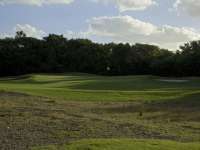 Since its opening in 2001, the Cozumel Country Club, Nicklaus Design Group 18-hole golf course has been steadily attracting more travelers to Cozumel. You'll see more in one day than others see in a lifetime!!! Bring your group and spend the day at our PalMar small, private beach facility and enjoy a day of snorkeling at Cozumel's premier beach entry snorkel spot! No crowds here and gates close daily with a maximum of 50 people on site! 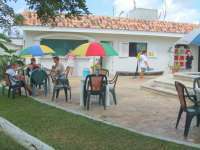 Plus Patas & Atlas Butterfly Sanctuary which, in 2018, merged with Cozumel Butterflies & Botanical Gardens is now included! US $14 Adults / US $8 Kids Includes FREE Drinks! Compact Class - Volkswagen (VW) Gol has a manual transmission, A/C, five (5) door hatchback and will hold a maximum of five (5) passengers. Convertible Economy Class - Chevrolet (Chevy) Pop Convertible has a manual transmission, comes in a two (2) or four (4) door option, no A/C and will hold a maximum of four (4) passengers. Economy Class - Chevrolet (Chevy) Matiz has a manual transmission, comes in a five (5) door hatchback, with air conditioning (A/C) and will hold a maximum of four (4) passengers. Subcompact Class - Both Chevrolet (Chevy) Aveo or Nissan Tiida have a manual transmission, comes in a four (4) door sedan, with air conditioning (A/C) and will hold a maximum of five (5) passengers.